Crazy Pineapple Poker is a popular up-and-coming game in many home games and poker rooms. This game is a spin-off of its more often played cousin – Texas Hold’em. It creates a bit more diversity to Hold’em so you don’t have to sit around playing the same boring hands as always. 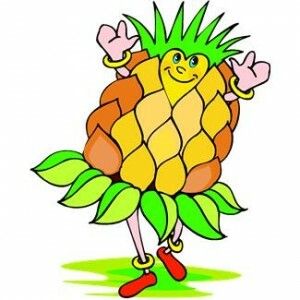 Crazy Pineapple Poker allows players to stretch their wings and hone new skills. Playing Crazy Pineapple Poker is easy once you get the hang of the rules. The basic Crazy Pineapple rules are not complicated to remember, but practice is the key to becoming a great player (as with all games of poker). This article will hopefully help you develop a Crazy Pineapple strategy so you can enjoy this fun game and hopefully win a few bucks if you play with your friends. To deal Crazy Pineapple Poker, just act like you are dealing Texas Hold’em, but deal three cards to each player instead of two. You still have your small and big blind to the left of the dealer button, there may be antes included, and betting will occur like normal preflop betting. Note: in Pineapple Hold’em (non-crazy version) each player would discard one card and make a two-card hand before the flop. Immediately following the first round of betting, the dealer turns over three community cards known as the flop. These community cards can be used with your hand to make the best five card poker hand. Another round of betting will take place just like in Texas Hold’em. After this flop bet, before the turn card, everyone must discard one of their hole cards and create a two-card hand. Following the discard, the rest of the hand will play out like a Hold’em hand. The dealer will deal the fourth community card known as the turn and there will be a round of betting. Then the final community card, the river, is dealt and there is the final round of betting. Showdown happens and the player that makes the best hand wins. You may use zero, one, or two hold cards along with any of the community cards to make your hand. Crazy Pineapple is primarily played as a home game as a fun variation of Texas Hold 'em. This means it is not found very often online. Carbon Poker is the one poker room that offers Pineapple Hold 'em for US players, but it rarely has people sitting down to play. If you really want to play Pineapple Hold 'em online, I would wait until a weekend or a holiday to play. This will ensure that the most players will be on at the same time and it will improve your chances of a game running. Good luck at the tables.